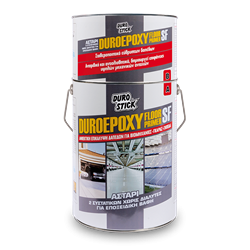 Highly durable and clear primer without solvents and great penetrating ability. Necessary substrate for the two component epoxy based paint DUROEPOXY FLOOR SF. It creates an abrasion resistant surface that does not dust and it is suitable for the surface stabilization and waterproofing of concrete and cementitious floor surfaces. It also functions as a system with the slip resistant mortar ANTI-SLIP, combining anti skid surfaces with hygiene. Classified SR-B2, 0-AR0,5-IR4 per EN 13813. 200-300gr/m² per coat, on properly prepared surfaces, depending on their absorbency.